2K released a new NBA 2K19 screenshot. This one featuring Donovan Mitchell, with an overall 87 rating. Let us know what you think. I wish we could get a shot of the courts players are basically the same but with sweat or muscle tone, but the 2k courts were not good at all detail wise last year. He’s ultra skinny like he was in 2k18. Doesnt make sense. It must have been all the feedback through the years during last gen's Mr. Universe player models. Ever since this gen started players have been either skinny or not muscular at all. You guys probably remember 2K14's Chris Paul... I don't think they are going to change it so soon. Jeez Demar's head looked to be in proportion but then theres this pic. I hope it's not another year of certain players with big heads. I want to see Drummond just for his head size. I also want to see the unicorn Porzingis who didn't look anything like him and he had spoken lines for the game. 2k at it again with players looking like theye never lifted a weight ever, meanwhile DM is ripped in his upper body. arms and traps look awful. same deal as 2k18. sorry to be negative, but not impressed at all. 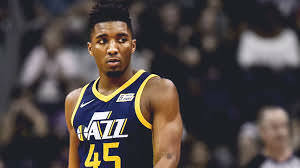 Can someone honestly tell me what the artists at VC do for the year between releases, how do you look at Donovan Mitchell's picture then give him pipe cleaners for arms and think "Yup, looks about right". The body types being so frail looking has been an issue awhile now, modders with much less resources correct a lot of 2k mistakes so I honestly wonder what is going on there. Yeah his arms look really bad. Looks like the same body type, face was updated though. Must be a middle school option to play as Donovan when he was 13, because he was bigger in high school than the 2k19 model. I was thinking same thing until steve posted it. Now I’m not sure. He needs a wider more fat body. I'm trying not to overreact but I can't help but be disappointed with the trend of inflated ratings. Mike Stauffer was one of the most thorough roster editors in the community before being hired by TakeTwo and now it seems he's succumbed to the rating hype marketing machine. Stauff was by far THE BEST ratings guy....and was slow to improve guys--loved that. I wont go as far as to say he's succumbed but why are guys going into 2K19 higher when have zero data re: their improvement? ?....thats marketing BS for sure. I'm a sixer fan but after his stellar playoffs i'd actually rate mitchell 1-2pts higher than Simmons. That Tatum is rated the same is some kind of sick joke. 2k just does what makes players happy. they gotta inflate ratings to keep up with myteam and players egos, as well as overrating most everyone so that the casual 2k player can go have a fun/highlight filled game rather than having to deal with a bunch of "specialty" players and quitting 2k because they cant score. He was bedwardsroy right? Pretty sure he was. His rosters were always the best to me. I still like his rosters but the level of detail since he got the 2K job has went down a bit. Mitchell is a near-perfect combo guard - beyond his shot creating ability and athleticism he has fantastic basketball IQ and is a good defender for his size. Mitchell isn't the most efficient scorer in the world, and isn't an ideal first option on a playoff team. He has a lot of time to become an Eric Gordon-caliber off-ball shooter, which would help his ability to play a secondary role.